Health Insurance: Now For Your Dog, Or Hedgehog Veterinary care is becoming more like medical care for humans — better and more expensive. And now, pet owners are beginning to buy insurance policies for their critters. But what will happen if it takes hold? Harriet the hedgehog underwent surgery for cancer and now takes anti-psychotic medication to help keep her from scratching the old incision. The operating room is filled with beeping equipment. On the table lies one of the millions of this country's uninsured. But we're not talking about an uninsured person here. No, we're talking about an uninsured dog. This is his second knee surgery, at a cost of $3,500 per knee. In the next room at Chesapeake Veterinary Surgical Specialists in Annapolis, Md., a Weimaraner has been knocked out and is being prepped for surgery. Actually, he's being vacuumed. It turns out that when a dog is unconscious, you can vacuum him. Down the hall, dogs with cancer are getting chemotherapy. The knee surgeon, Dr. Darren Roa, says that not long ago, animal clinics on this scale just did not exist. "The number of surgeons and internists and cardiologists and large megapractices like this across the country has gotten astronomical," Roa says. "Twenty-five years ago you couldn't find a surgeon without a university. And now there's thousands of them." Pet health care is now crossing the same magic threshold that human health care crossed decades ago: It's getting good, and it's getting expensive. Veterinary bills are becoming large enough that people are starting to think it would be nice to have someone else pay for them — like an insurer. As with pet owners nationwide, only a handful of the people who come to this hospital carry insurance for their critters. But the business is growing rapidly, at a pace of 15 or 20 percent a year. It's an open question whether pet health care will also mimic the problems of human care, with costs that keep climbing and lots of waste. The problem with insurance, economists say, is that it separates people from the money they're spending. Why not get that extra medical test, if it's covered by insurance? And from a veterinarian's perspective, health insurance for pets means more money. Susan Markham is one small force behind the growth in pet health insurance. Markham works for Veterinary Pet Insurance, the largest company of its kind in the country. Markham recently made her pitch at a veterinary hospital outside Atlanta. The staff sat around, some in scrubs, listening politely and eating barbecue the insurance company paid for. Markham could tell her audience that pet owners who get insurance end up spending twice as much on health care. But she doesn't, because she's got a much more powerful weapon — kittens, in particular one named Minnie. "A young mother and her 8-year-old son brought Minnie in," Markham tells her audience. "He was crying. He had stepped on Minnie's leg and it was fractured. And Dr. McCarthy said, 'Good news. She'll go home with you tomorrow. You won't notice that anything has happened to her six months from now. She'll heal up and be just fine.' But sadly, that young mother declined that treatment. Who can tell me why she might have done that?" The audience guesses correctly. Minnie's owner felt that she couldn't afford to get the kitten's leg fixed and instead took Minnie to be euthanized. Veterinarians are animal people, and they hate having to kill an animal they can fix. When she's finished, Markham leaves some pet insurance brochures and giveaway pens on the table. The upside of any kind of insurance, of course, is that it saves lives. If you're trying to decide how you feel about insurance for pets, you might consider the experience of someone who has purchased it. Kristen Zorbini Bongard of Janesville, Wis., got coverage for her hedgehog, Harriet, that came in handy this year. "We first noticed that something was up with Harriet in March," Zorbini Bongard says. "I was sort of doing some snuggle time with Harriet and noticed that she had a lump." A test at vet's office showed the lump was cancerous. Zorbini Bongard scheduled a date for surgery. The lump popped right out. But there were complications. Harriet ripped open her sutures, so the incision had to be stapled shut and a second surgery ensued. But sometimes, Harriet still scratched at that spot. She ended up on anti-psychotics — the only hedgehog whom Zorbini Bongard knows has ever been prescribed them. If that level of treatment for a hedgehog seems crazy to you, then you don't know Kristen Zorbini Bongard, and you don't know hedgehogs. 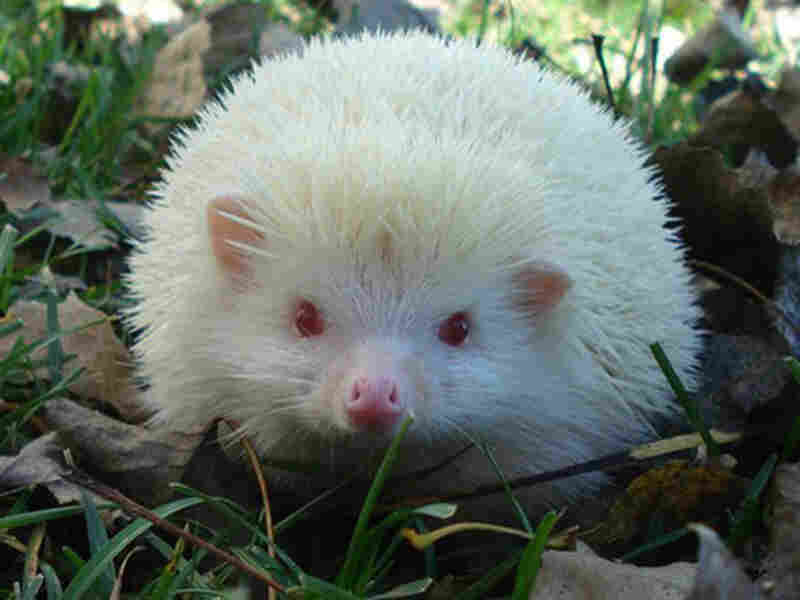 One of the many great things about hedgehogs, Zorbini Bongard will tell you, is that they can roll up into little balls. "It's adorable," she says. "All of a sudden you see a nose pop out, and two eyes, and maybe the front two paws, and then some ears. It's a very cute thing to watch." Health insurance for that bundle of cuteness costs about $80 a year. Harriet's total bills came to $2,700. The insurance covered most of the early stuff. In the end, Zorbini Bongard and her husband had to pay about $1,900. Zorbini Bongard says that they're not rich and that, like a lot of people, they've been cutting back. She says insurance changed things for her, in that she spent more on Harriet's care than she would have otherwise. On the other hand, Harriet's alive. So, what would an economist make of all this? Tim Harford, who writes a column for the Financial Times called "Dear Economist," says the insurance for pets is both good and bad. It's clearly providing a service. But the nature of insurance, he explains, is to create distance between you and the cost of services. It's no comfort to him that veterinarians aren't necessarily driven by a desire for profit. "Human doctors are reasonable people as well," Harford says. "They're not just in it for the money. I'm sure the money is nice. They also want to make people better. But we know that doctors and vets, too, are constantly making these marginal decisions. And if you've got a situation where you're going to make more money ordering tests, the dog's not going to suffer. There's a small chance the dog might even benefit. It's the insurance company that's going to pick up the tab." He argues that leads to a decision based on "Why not?" Zorbini Bongard agrees that insurance could lead to wasteful tests — for certain pets. "I can see how that could be, especially for dogs or cats," she says. "But I guess for me as a hedgehog owner, there's not that much to do." She and her husband pay for the anti-psychotics themselves, and they're willing to chuckle at themselves for doing it. Harford says it's unlikely that pet insurance will end up with the same problems as human health insurance. The way a lot of plans are set up now, pet owners typically have to pay a substantial portion of the bill. That means they're likely to think twice before getting a test or procedure done. There's another difference. Pet owners generally have a limit on what they will spend. But for human health care, when our own lives are in danger, or our wife's or our husband's or our kids', we want the insurance company to pull up to the hospital — with a huge truck full of money.